A historical novel that lives up to its name. 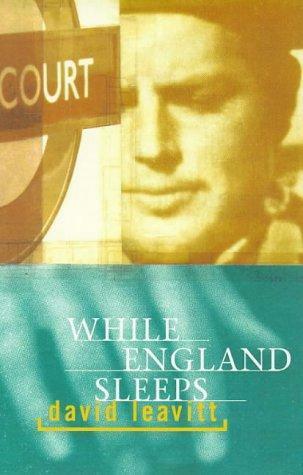 Set against the rise of fascism in 1930s Europe, While England Sleeps tells the story of a love affair between Brian Botsford, an upper-class young English writer, and Edward Phelan, an idealistic employee of the London Underground and member of the Communist Party. Though far better educated than Edward, Brian is also far more callow, convinced that his homosexuality is something he will outgrow. Edward, on the other hand, possesses “an unproblematic capacity to accept” both Brian and the unorthodox nature of their love for each other—until one day, at the urging of his wealthy aunt Constance, Brian agrees to be set up with a “suitable” young woman named Philippa Archibald . . . Pushed to the point of crisis, Edward flees, volunteering to fight Franco in Spain, where he ends up in prison. And Brian, feeling responsible for Edward’s plight, must pursue him across Europe, and into the chaos of war. About the author: David Leavitt is a graduate of Yale University and a professor at the University of Florida, where he is the co-director of the creative writing program. He is also the editor of Subtropics magazine, The University of Florida’s literary review. I was looking for a good adventure story this week, and with luck While England Sleeps, by David Leavitt [Bloomsbury USA; 1 edition, June 3, 2014] came into view. The story is set in 1930s England, the years leading up to WWII, and features a young aristocrat (dilettante) named Brian Botsford, an amateur playwrite and narrator, and his opposite, Edward Phelan, an idealist and Marxist-labourer. From this perspective, one might assume that this is a story about class—and it is to a certain extent, but it is also a story about different ideals and approaches to life. Brian is in a word “spoiled,” with little ambition beyond floating on the surface with the largesse of an aunt. Edward, on the other hand, is self-educated and ambitious to ‘work his way up’ to a better life. In fact, Brian is not a very likable person, an ‘anti-hero’ and purposely so. Now, from a writer’s point of view this is a risky proposition—to invite your audience to dislike your main character—but with an ounce of redemption Leavitt pulls it off quite admirably. It all comes together when Edward makes an attempt to rescue friends from the growing storm in Europe, but to get into the part of the plot would definitely be a spoiler, and so I will leave it for the readers to discover. One of the things I like about this story is the subtle way the author draws the reader into the tenor of the times. In spite of the fact that the dialogue tends to slip into a more modern vernacular from time to time, the reader is nonetheless persuaded that they are experiencing 1930s England or Europe, as the case may be. Likewise, the mock prologue and epilogue add a sense of time and place, as well. However, if you are the type that prefers a happy-ever-after ending, this might not be the story for you. Four and one-half bees. It is a collection of people, facts and events in Canadian history, and includes a bibliography of interesting Canadian books as well. Latest post: James Anderson: One of Canada’s steadfast but lesser-known explorers.